Led by textile scholar and Slow Fiber Studios founder Yoshiko Iwamoto Wada, the 6th India Study Tour focused on local textile craft, inventive traditional and contemporary art, and historic architectural sites by traveling to some of India’s most vibrant cultural centers and natural beauty from Rann of Kutch to Backwater of Kerala to Green Hills of Western Ghats. We explored the contemporary art exhibitions at the Kochi-Muziris International Biennale; exchanged ideas and broadened our dyeing knowledge at the Natural Dye International Forum in Munnar; visited with collectors, artists, and designers at their private homes and studios; wandered through the collections at key museums and galleries; engaged in hands-on workshops with local artisans; enjoyed local cuisine and overnight stays at traditional inns and historic haveli townhouses. Led by Slow Fiber Studios founder Yoshiko Iwamoto Wada, this tour included visits to key cultural and textile centers including artisan studios in Arimatsu-Narumi, a neighborhood with over 400 years of history practicing traditional Japanese shibori dyeing; some of the last remaining sericulture farms and factories producing Japanese silk; and safflower dyeing museum in the Tōhoku region. Travelers were given the opportunity to visit artist’s homes and studios, unusual museums, gardens, and temples; engage in hands-on workshops with local artisans; and enjoy seasonal Japanese cuisine and unique traditional inns. The Post-Tour Extension focused on contemporary art and architecture and featured visits to unique and hard-to-reach art sites as well as stops along the Shōdoshima Island with Buddhist pilgrimage route. With tour leader Yoshiko Iwamoto Wada, travelers started in northwestern India to explore India’s capitals of New and Old Delhi, and visit designers and artisans’ studios for block printing, Indian shibori, and fine couture. They visited the Maharaja’s palaces, Calico Museum of Textiles, and Gandhi Ashram in the states of Rajasthan and Gujarat. Travelers flew down deep in the south on the Malabar coast, explored the backwaters of Kerala, visited the third Kochi-Muziris Art Biennale, and traversed the green mountains of the Western Ghats participating in a natural dye workshop in Munnar and visiting an organic cotton farm and handloom weaving center in Pollachi. A rare textile program to work with four masters in natural dyeing, shibori and Tibetan tablet weaving ( Dr. Yamazaki, Ms. Yoshiko Wada, Mr. Hiroshi Mursae, Dr. Torimaru ) at the iconic Jin Ze Arts Centre, located in the historical canal town of Jin Ze on the outskirts of Shanghai. The program also included optional one day tour to Hangzhou/Suzhou or any other fabric market in Shanghai. See natural dyeing workshop blog. The 17-day main program included visiting key cultural and textile centres in Nagaoya, Arimatsu, Kyoto, Takasi,Kiryu, Chichibu and Tokyo. The focus of the tour was on indigo, shibori and silk, highlighting traditional skills, modern techniques and collaborative innovations. The participants had the opportunity to visit important museums, local gardens and temples as well as appreciate nature, craft and local traditions. The program is designed to coincide with Japan’s annual Shibori Fest in Arimatsu. This enables the participants to get a first-hand feel of the finest shibori Japan has to offer! Included in the itinerary were seminars on sericulture and weaving and optional programs on indigo dyeing and 4-session technical workshop in Arimatsu. The 2015 tour also offered an extension – a once-in-a-lifetime contemporary art experience at Benesse House and Museum on Naoshima, Shodoshima, and Teshima Islands in the Inland Sea! The essence of SFS 2015 India program is captured in this excerpt from WSN Member Carol Bier’s Notes From India. Carol was a participant in the program. “India is vast, dramatic, beautiful, serene, bursting with colorful energy and generosity of spirit — from the slightly outrageous brash squirts of color of the Hindu spring holiday of Holi to the crazy traffic of Delhi in constant motion with neither stop signs nor lights but many roundabouts. Delhi is far grander than I ever expected. A few days’ into our journey, I had time to reflect on a houseboat (interlaced reed architecture afloat) in Kerala’s placid backwaters. Soon enough I felt privileged to witness a multi cultural democracy that actually functions well most of the time — the diversity of religious practices, languages, ethnicities, identities is profound, amazing, and long-standing. Saris with interwoven gold threads, gilded flowers block printed, glazed cottons, sheer muslin, tie-dyed bandhani, bright shiny silk and the intensity and saturation of natural dyes, add to this the sparkling glass bangles and silver rings on toes, ankle bracelets, and neckbands. Color and sparkle everywhere. Horses, donkeys, and camels are bedecked. Even elephants’ faces and ears are painted. My joyous journey was shared with other textile specialists, gathered and organized by Yoshiko Wada and her dedicated staff at Slow Fiber Studios and the World Shibori Network. Our tour involved opportunities for collaborative learning, workshops with artisans and textile makers, demonstrations and seminars focused on textile production, traditional technologies and sustainable processes.” More pictures from the tour can be seen on our Flickr feed < here >. Pre-Conference Workshop Tour to Shanghai, Nantong and Suzhou. Post Tours to nearby places in Haining and Wenzhou. 10-13 day tour to the “Silk Road,” explored Xinjiang (Urumuqi, Hotan, Kashgar, Turfan), Xi’an(Shaanxi Province), and Dunhuang (Gansu Province). A trip through the south of France to various cities; Nimes-Tarascone-Fontaine deVaucluse-Lacoste-Apt-Lourmain-Roussillon-Lauris. 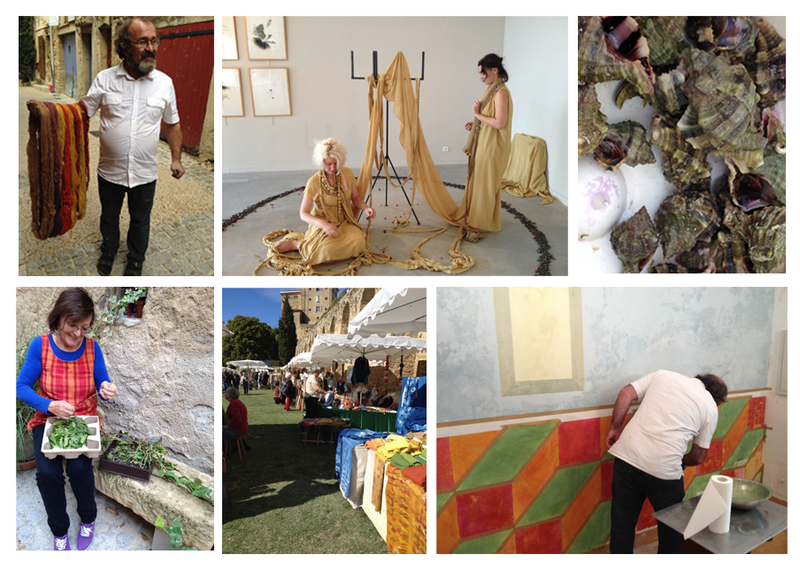 Participants had the opportunity to learn about sustainable natural dye and pigment from Michel Garcia at his atelier, and observe the filming of Natural Dye Workshop 3: Colors of Europe. This workshop focused on organic lake pigment, dye extract, paint, and ink using sustainable methods. After the workshop in Lauris, attendants participated in the Forum International de la Couleur Végétale(International forum for Natural Dyes).At the forum, travelers attended workshops(where they learned about purple murex! ), lectures and viewed natural dye goods at the artisan market. SFS also participated in an exhibition, Seeds of Color in the Flow of Time (Le temps s’égraine) where participants could exhibit their own work. See our Flickr for more photos! Delhi, Kerala, Tamil Nadu, Ahmedabad with extension to Kumoan Himalayas. Special opportunity to travel throughout India with Yoshiko, who has been exploring this country for over 30 years. Yoshiko will introduce her friends in India who are involved in welfare, community empowerment, and cultural sustainability projects. Tour highlights: natural dyes, organic cotton cultivation, handloom weaving, khadi, biodynamic farming, architecture, local food and religion, contemporary art and design educational institutions, museums, solar energy development, hand spinning and weaving wild silks and Tibetan wool in Himalayan communities. 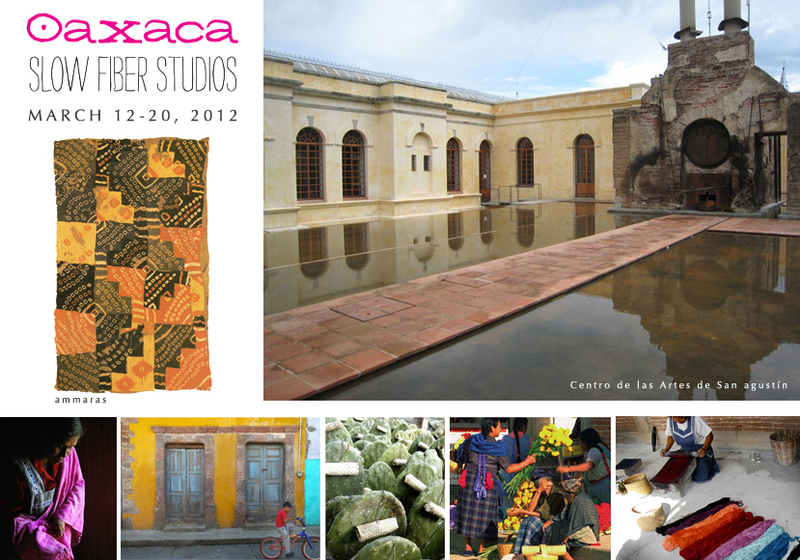 [BY INVITATION] Natural dye film / workshop program on location with botanist-chemist Michel Garcia of France at the beautiful ecological arts center (restored former textile factory) Centro de las Artes San Agustin (CaSa). With private tours of the ethnobotanical garden of Oaxaca and Museo Textil de Oaxaca, visits to local cochineal farm, weaving villages, nearby Zapoteca ruins, and village markets. The timing of this program is designed to coincide with Japan’s annual Shibori Fest in Arimatsu. This Arimatsu program will be offered annually around May/June.Focus: Surface design intensive: silk, steel, shibori, kimono, kakishibu, katazome. Traditional skills, modern techniques, collaborative innovations. WSN Memeber ellen Katz did a wonderful job of posting on her blog about a trip to a Shoyeido Incense Workshop. You can read more and take a look at pictures here. [BY INVITATION] Special opportunity by invitation to travel through India with Yoshiko. She has been traveling throughout this country for over 30 years including living in Ahmedabad in 1983/84 on a Education & Culture Fellowship and frequent subsequent 3-month residencies continuing throughout the last 3 decades. TOUR FOCUS: natural dye and paper making with Mr. Shio, master artisan of Japanese paper making. Other highlights: organic cotton cultivation, handloom weaving, khadi, natural dyeing, biodynamic farming, architecture, culture, and more. [BY INVITATION] Focus: 12 Half-day Classes on Natural Dyeing with Michel Garcia; video documentation with Studio Galli Productions for upcoming DVD. Optional trip extension to visit Provence. About Michel. Founder of the association Couleur Garance (1998) and of the Botanical Garden of Dye Plants (2002) in Lauris. A French national born in Morocco, Michel Garcia established the Couleur Garance to connect ecologically sensitive artisans with the expertise of an older generation of dyers. In 2002 Michel founded the Botanical Garden of Dye Plants at the Château de Lauris, which would later grow to add an international forum and market for natural dyes and a resource centre. In 2006 Michel handed over leadership of Couleur Garance so that he could further pursue his interest in colour and dye techniques. He has published three books on natural dyes showing the range of shades available and how to obtain them. Michel is a botanist, chemist, natural dye specialist and philosopher. Held on the beautiful grounds of Masseria della Zingara, hosted property of Jan King of Twisted Thread UK. Offering two 1-week courses: (A) JUNE 15-19 and (B) JUNE 22-26. Immerse yourself in workshops taught by Michel Garcia of Lauris, France, who will share his expertise on natural dyeing and Provencal block printing, and with Yoshiko Iwamoto Wada, who will explore shibori and Japanese rice paste resist stencil dyeing. Focus will be low impact, sustainable surface design practice. A rare opportunity to travel with Yoshiko in a small group to India. Focus is on organic cotton cultivation, handloom weaving, khadi, natural dyeing, biodynamic farming, and on. Yoshiko lived in Ahmedabad in 1983/84 under the Indo-US Subcommission for Education & Culture Fellowship. She was affiliated with the National Institute of Design (NID) and established a wonderful friendship with numerous fine, talented people. Subsequently, over a span of 9 years, Yoshiko went back to India for 1 to 3 months at a time and traveled extensively throughout the country. Over the past decades, she has made annual trips back to India for various projects — ongoing consultancy assignments primarily for Christina Kim of dosa inc. and Aranya Naturals; to co-chair the 2nd International Shibori Symposium held at NID; and for Sri Yantra, a post-earthquake seminar with involvement by Jack Lenor Larsen, Christina Kim, and Marian Clayden. Tight, 10-day program visiting people & places of great textile and cultural interest as we travel through Kiryu, Kyoto, and Tokyo. An invaluable introduction to the country and culture as seen from Yoshiko’s eyes and a chance to meet her colleagues. Focus: Jacquard, dobby and other computer aided techniques including weaving, knitting, lace, silk-reeling, back strap weaving, finishing, and etc. in Kiryu. The Festival of Ages (Jidia Matsuri) in ancient capital and indigo natural dyeing in rural village as well as a day visit to shibori center in Arimatsu. Cultural sightseeing with textile interests in the forefront.